With chaos as a management style, deflection, diversion, and disruption become management tactics. We respond at an emotional level, and that allows those waiting for the diversion, the operatives, to go into action. Critical in effective response is to depersonalize that which is dismissive, insulting, and hurtful. The goal is to resist the emotional bait. What we can control is how we evaluate and respond; it is not easy. The overt hostility towards climate science has increased since the election. In fact, there is even new hostility towards climate scientists. If I practice what I preach, and depersonalize the attacks and avoid the emotional bait, I can go back to a old article, Climate change: A fundamental shift of our place in the world. In that piece I wrote, If we are to use the knowledge of climate change, then we challenge the familiar power structures of economies, politics, beliefs and perceptions. These challenges are consequential to a far larger portion of society than those of Copernicus, Galileo or Darwin. Galileo was, in 1633, interrogated for 18 days in the Inquisition. It was not until 1992 that Pope John Paul II, officially accepted Galileo’s work. People die in the circumstances of great challenges to belief. We should expect, therefore, hostility as part of the world’s response to the knowledge of climate change. The Trump-facilitated attack on science is expected, and we do need to take on the battle. After all, the impacts of climate change are more consequential that whether we orbit the Sun or the Sun orbits us. In an earlier blog, I argued that there was possible opportunity in Trump’s swift changes of position that would make political walls porous. A characteristic of Trump’s chaotic impulses is that much of the attention is brought to Trump. Aside from disruption of the establishment, there is little coherent vision on most of the policy and practice of the federal government. The disruption serves mostly, therefore, to increase risk by allowing exploitation by those ready to exploit instability and weak leadership. It is easier to destroy capacity and infrastructure than it is to build capacity and infrastructure. By placing those who are hostile or ambivalent to science in key positions, ease to destroy scientific capacity and scientific infrastructure is created. If those who are interested in preservation of such capacity are required to form new coalitions in order to concentrate enough influence to be effective, then those in power have even more short-term ability to diminish capacity. The attacks on science are, unfortunately, just a subset of a broader attack on rationality, knowledge, and objectivity. We face issues of basic truth; we see challenges to the integrity of law. Therefore, the attack on science is only part of a more profound and important attack on principles of equality, opportunity, and education. Hence, rather than the arguments of the climate scientist about climate science, I am drawn to the foundations of the checks and balances in our government. 1) Freedom of the press, an open press, and a well-funded press based on the classical principles of journalism. 2) A judiciary that stands in balance to the legislative and executive branches and resources to litigate challenges to existing law. 3) Presence and organization in the political and public forum. For this blog I will focus only on free press and the access to verifiable knowledge. I will end with a set of resources that, in my evaluation, are generally good places to get climate “news.” In my next blogs I will discuss the judiciary and the science community’s presence and organization. Recent history reveals an amplified challenge to the credibility and legitimacy of knowledge. In an earlier blog I wrote, Access to information, opinions, ideologies, conspiracies, sociopathic rants, allies, and hostiles is changing individuals, communities, and institutions. This democratization of information supports the easy use of science to support wants, beliefs, and emotions. It weakens the foundation for evidenced-based, science-based decision making. There is little evidence that we will return to the past. We are faced with a crisis of truth. Propaganda, misinformation, manipulative media, and pranks stand next to knowledge, events, and facts as equal. Different points of view on the same sets of knowledge, events, and facts get distorted into tribal truths and lies. We develop this strange sense of fairness that incorrectness and correctness deserve equal representation because of self-identification of “truth” as what one believes. We are faced with George Orwell’s. “Whatever the Party holds to be the truth, is truth.” Speaking lies is equated with freedom of speech. Social media is part of the problem. Stories get propagated around the world in a matter of hours, if not minutes. Their headlines scream that some person crushed another person with a tweet or a smirking comment. We get to see people’s guttural reactions. We take serious issues and turn them into battles of personalities; we cheer the clever retort from someone on our side. Stories that do not agree with our point of view are passed around and dismissed as the laughable cluelessness of the other tribe. As anxiety increases people lose their rationality and engage in the amplification of anxiety. We contribute to our undoing. As emotions ramp up, as clever retorts escalate, science advocates and scientists participate, distortion increases, and the integrity of science is diminished. A free press has served us well many times, and it is, presently, as important as ever. With the changes brought to the business of journalism by the Internet, it is especially important to identify and to support credible sources of news and information. It is easy for propaganda, misinformation, manipulative media, and pranks to be provided free of charge. It is more difficult to provide free, high-quality journalism. It is unreasonable to expect that objective, quality journalism and science reporting be carried, solely, on the back of advertisement. People need to pay for subscriptions and donate to nonprofits. Here is a list and short analysis of 10 Journalism Brands Where You Find Real Facts Rather Than Alternative Facts. These are all sources that I look at on a weekly, if not daily basis. I point, also, to what I consider credible bipartisan political analysis summarized in Right and Left: Partisan Writing You Shouldn’t Miss. With regard to where people get their news, The Pew Research Center collects and analyzes data on journalism and the media. In 2014, they released the results of a comprehensive study Political Polarization and Media Habits. A couple of things are striking. First, those who identify as politically conservative are far more homogeneous in their news sources and social media presence that those who identify as liberal. Second, Fox News (in 2014) was a more influential source of news than any other single source. Fox News does not merit mention, even as a runner up, in the article mentioned above, 10 Journalism Brands Where You Find Real Facts Rather Than Alternative Facts. Normally, I do not reference web resources that do not provide information about their identity. This is an exception from the website All Generalizations are False. (Thanks to Marshall Shepherd for pointing out the site.) Below, I link a figure entitled News Quality. There is much on this chart that is consistent with the references linked in the previous three paragraphs. 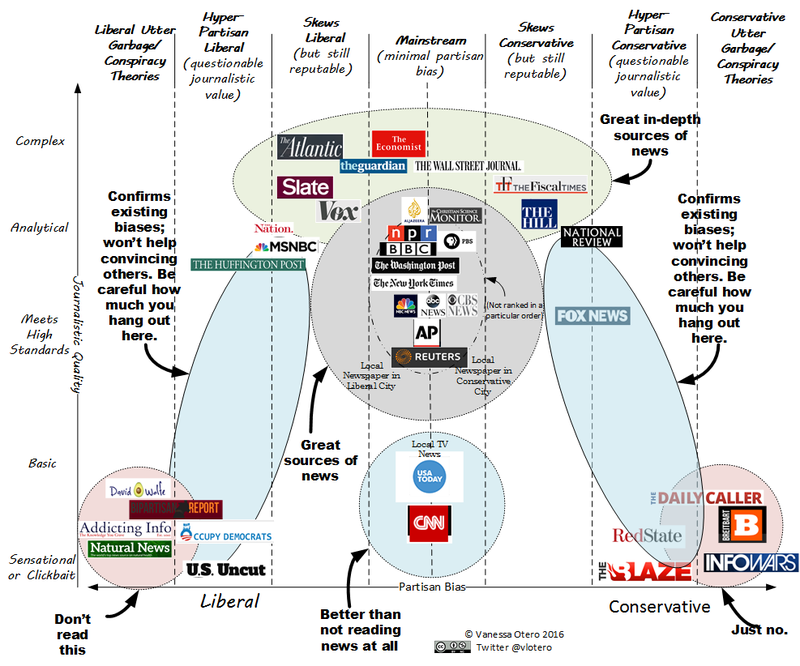 The chart is also consistent with my evaluation of news sources; hence, I bask in the comfort of confirmation bias. Finally, there are many good websites with excellent climate information, including Wunderground.com, where I post. Otherwise, I have compiled a selection of Climate Change News Websites. Please note that my list includes compilations, by others, of climate change blogs. Figure 1: News Quality. From All Generalizations are False, and here is The reasoning and Methodology Behind the Chart.